PATTAYA:--Two cars were damaged when a wheel flew off a tour bus carrying Chinese tourists in Najomtien. A Chevrolet Trailblazer driven by Radsamee Kulalai, 45, and a Toyota Vigo plate driven by Jamnien Sangngam, 37, both suffered dents. No one was injured. 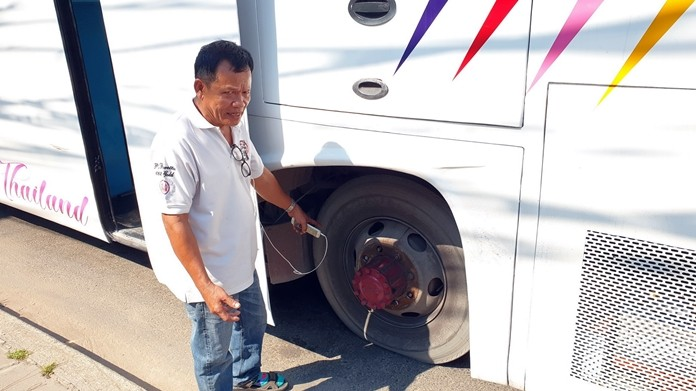 Bus driver Eakachai Seranon, 60, said he was bound for a Sattahip tourist attraction when he heard a strange noise from the back of the coach. He then heard the accident on Sukhumvit Road at the Ban Amphur intersection March 12. Inspection showed the 8 lug nuts holding the wheel had sheared off. A nutter "fixed" the nuts. Why don't I hear such stories from home country? The driver obviously didn't do his first parade service this morning, that means walking around your vehicle visually checking that all lights work, wheel nuts are tight and secure, tyre pressures correct, tread depth, oil levels, fluid levels etc etc...................Cretin. too far lose,so are going to be need replacing.ASAP. Bus blew a tire on my way to Koh Chang, loud! Maybe a shortage of nutters? If such a thing flies of at high speed it kills. Remember the poor scooter riding girl killed by a flying wheel? Because you are blinkered? You need to try googling it, there's plenty of evidence that it happens worldwide, it is not peculiar to Thailand! From the photo something is not adding up .. 4 of the studs look to have sheared off but wheel nuts appear to still be in position on 2 others ..
Google. There's no shortage of UK, US, European or other nutters, so easy to find plenty. HGV and Public Service Vehicles in the UK require a 'walk around check ', this is before your vehicle is driven. You have to record all these checks and also defects in a daily log, this is then signed by the driver. It is an offence not carry out this procedure. My Mrs was explaining to me only last night how a HGV truck driver in Thailand was investigated after an accident and he had a record of over 100 previous tickets, some accidents involving the deaths of people. A dangerous driver who cared not a whit and free to kill and maim further. A lot to be done here in Thailand.